We will not desert you after the order contract is signed. We make every effort to maintain our products and systems. We can also take care of the logistics for you, if you wish. We ensure that your palletizing line is always supplied by storing a safety reserve of your GRIP FIX™ product at our facilities. 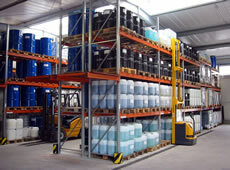 Our sales partners are also able to maintain safety reserves for you at their sites. Our production turnaround times are short, which means we can dispatch your orders rapidly. If you must have one of our products immediately, then express delivery is an option. One more added value benefit is that our GRIP FIX™ products reach you free of shipping charges. We issue a 5-year guarantee on our BAG FIX™ application systems (excluding wear and tear parts). Of course, we also extend the offer of establishing an individual maintenance contract with you.